Living with diabetes or prediabetes requires constant monitoring and vigilance when it comes to your blood glucose levels. For someone with diabetes, a level that is too high or too low could result in adverse reactions like dizziness, irritability, weakness, increased thirst or hunger, and exhaustion. While many are aware that certain foods can impact their blood sugar, there are other factors that may be just as detrimental to maintaining a normal glucose concentration in your blood. Continue reading to learn how environmental factors may be influencing your blood sugar levels, as well as how to properly test your blood sugar, and what to do if you have high or low blood sugar. Foods high in starches, sugars, and caffeine have all been associated with raised blood sugar levels, but did you know that similar effects can be caused by factors not related to food intake? Below are some of the most common causes of blood sugar fluctuations that are not linked to food. Cold and flu. An illness like the common cold or flu can cause a spike in blood sugar as your body works to fight the invading ailment. Ensure you stay hydrated, and notify your doctor if you are experiencing vomiting or diarrhea lasting more than two hours, or if you have been sick for more than two days and showing no signs of recovery. Stress. Especially common for those with type 2 diabetes, stress can cause your body to release hormones that raise your blood sugar. Combat this external influence by learning relaxation techniques and trying to reduce stress in your life wherever possible. Steroids and water pills. Corticosteroids used to treat a variety of conditions like rashes, asthma, and arthritis can raise your blood sugar levels and, in some cases, trigger diabetes for certain individuals. Similarly, diuretics – commonly referred to as water pills – are meant to help those with high blood pressure, but can also raise blood glucose levels. In contrast, medications like antidepressants have been found to either raise or lower blood sugar levels, meaning you should be mindful about which medications you are taking. Decongestants. Cold medicines that help relieve your stuffy nose often contain pseudoephedrine or phenylephrine that can cause a spike in blood sugar levels. Some cold medications also contain sugar and/or alcohol in small quantities, so it is best to avoid these brands. Chores. Completing the household chores like mowing the lawn or cleaning up may actually lower your blood sugar, providing a benefit for those with diabetes who have trouble managing their glucose levels. Sleep. Sleep can cause your blood sugar to dip dangerously low, especially in diabetics who take insulin. In contrast, some may experience spikes in their blood sugar when they first wake up, even before eating, due to hormone fluctuations or drops in insulin levels that occur during sleep. Check your blood sugar before bed and first thing in the morning to monitor whether you are affected by either of these trends so you may take corrective action. Exercise. While some moderate exercise may help you lower your blood glucose levels, working out too hard may result in a blood sugar spike while exercising, followed by a drop that can last for up to 24 hours afterwards. Take care when exercising and consult your doctor and/or a personal trainer to help you create a fitness regimen that will keep your blood sugar level in a safe range. Heat. Heat makes it more difficult to control your blood sugar, so it is important to stay cool during periods of excessive heat. Ensure you are well hydrated and test your blood glucose levels regularly to keep an eye on your sugar and adapt to your changing needs as necessary. Testing your blood sugar is a relatively simple procedure that you can perform almost anywhere, provided you carry your glucose meter with you. To test your blood sugar, begin by washing your hands thoroughly and inserting a new test strip into the meter. Prick the side or tip of your finger with the attached lancing device, and apply the edge of the strip to the drop of blood that appears. Wait for your meter to test your blood, then review your reading on the screen. The recommended level before a meal is approximately 80-130mg/dL, and less than 180mg/dL one to two hours following the beginning of a meal. These numbers are guidelines, but do not reflect the individual needs of every patient. If you have tested your blood sugar and it is outside your recommended range, the following methods can help you regulate your levels. Low blood sugar. If your blood sugar is too low, you may feel weak, hungry, sweaty, and drowsy. In severe cases, you may also lose consciousness or have a seizure. To combat low blood sugar, consume 15 grams of a fast-acting carbohydrate such as glucose tablets, sugar water, juice or soda, candies, or honey. Wait 10 to 15 minutes, then check your blood sugar again. If it is still too low, consume another 15 grams of fast-acting carbohydrates, and if you plan on being active, eat a small snack like cheese and crackers or half of a sandwich. Be sure to wait 45 to 60 minutes before driving. High blood sugar. High blood sugar may cause you to feel thirsty and tired, and prompt you to urinate more often. Your doctor will have outlined a treatment plan for managing high blood sugar levels that may include a meal plan, activity regimen, as well as some medications and/or insulin. If you are experiencing persistent high blood sugar while following this treatment plan, contact your doctor, as certain aspects may need to be adjusted. 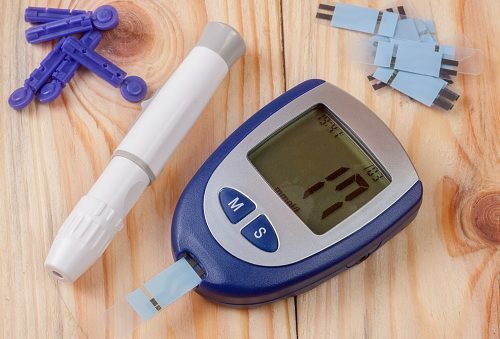 Your blood sugar may fluctuate due to a variety of factors – aside from the foods you eat. If you have diabetes or are at risk of developing the condition, it is important that you monitor your blood glucose levels and are aware of any factors that may raise or lower your blood sugar.